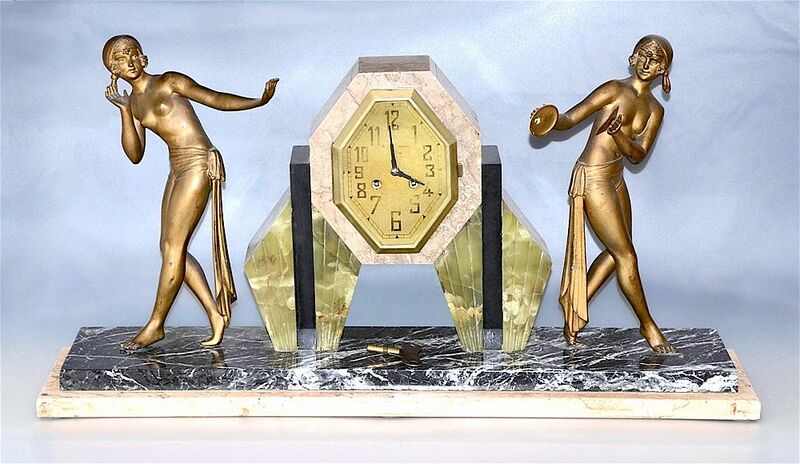 This imposing Art Deco clock has a two tiered marble base. On either side of the clock are two spelter figures of semi-clad women, one playing the cymbals and the other adopting a listening pose. The elongated octagonal shaped clock is raised up from the base by two flared columns that are fronted in incised veined green onyx with a central black onyx slab. The clock is housed in a marble fronted octagonal casing. The clock has a gilt face with slightly faded black Arabic numerals. The clock is an 8 day movement and strikes the hours and the half hour.